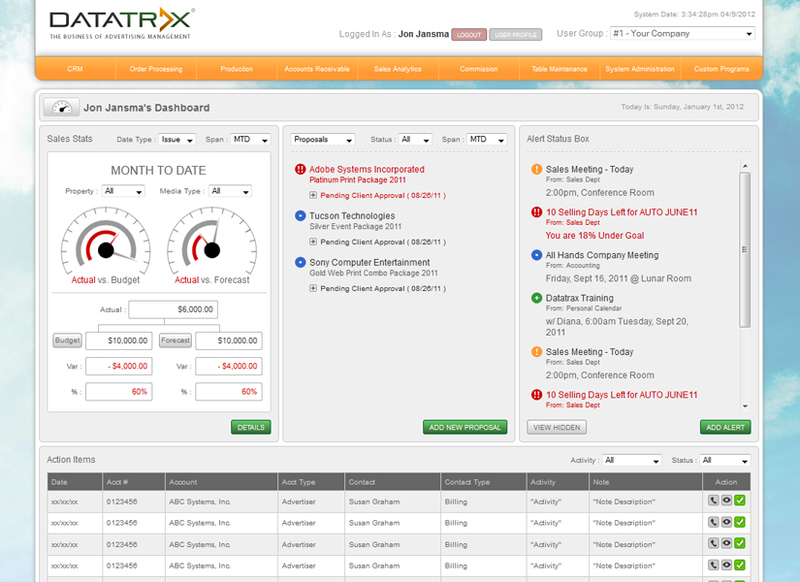 The Datatrax® Browser Based Software comes complete with all the Ad Management features and functionality you'll find in previous versions of our other software, plus expanded features and benefits to save time and money! Simple to Operate and Powerful Results! Flexible, feature-rich performance provides easy access to data with built-in "look up tables", data mining for quick data sorts with the click of the mouse and intuitive, simple data entry screens for quick data processing and on-screen queries. Runs on both PC and Apple Macintosh computers, accessible from web anywhere in the world via standard web browser (MS Internet Explorer 5.x for Windows or MS Internet Explorer 5.2.2 for Apple Macintosh). Seamless, centralized database offers immediate access and views of client sales activity, order transactions, current and historical contracts, customer payment and accounts receivable history. Shorten sales close cycles with the automation and management of sales functions like: activities scheduling and follow up calls with contact management, send letters, e-mails, order and contract acknowledgements via e-mail, custom targeted e-mail blast campaigns and direct mail campaigns. 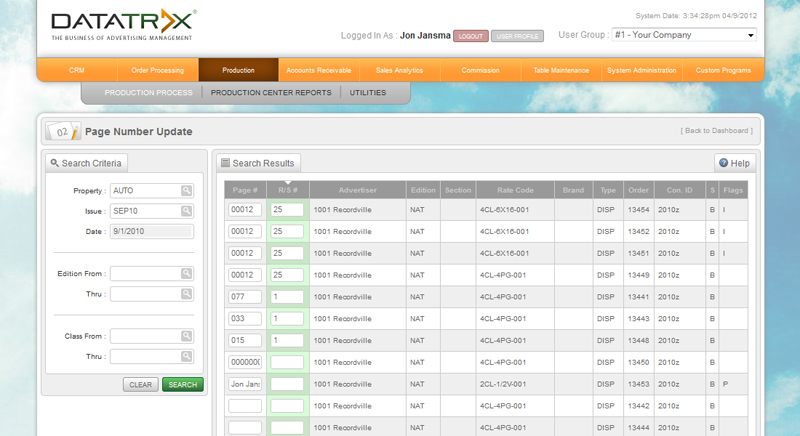 Comprehensive reports track sales pipeline processes, provide budget and forecast projections, identify market trends and future revenue opportunities, evaluate business performance, ROI and compile comparative analysis from a variety of perspectives including: Publication, Product, Rate, Ad Type, Sales Region and Territory. Flexibility in scale provides opportunity to develop simple to complex management processes. Unlimited Profit Centers, Publications, Rate Cards and Reporting to adapt to your growing publishing, classified advertising, directory and trade show businesses. 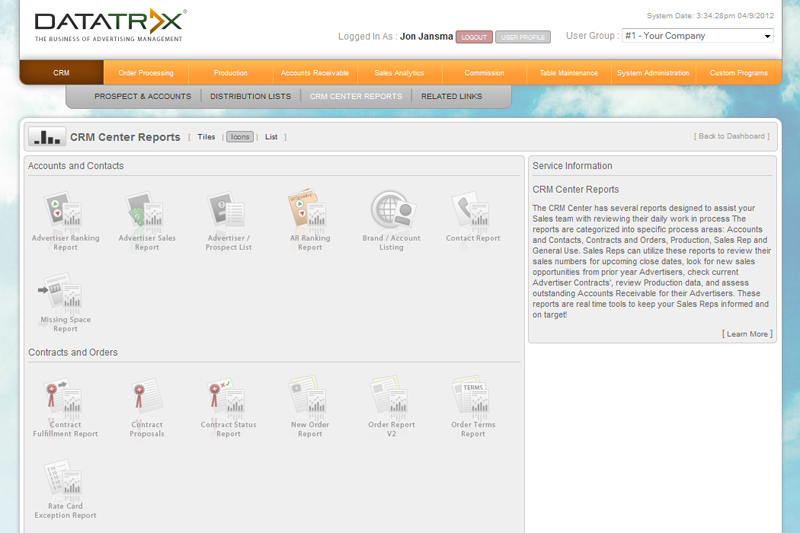 Credit and Collections module drives the efficient and timely collection of your advertising revenues. Create collection note ticklers by client account, set up payment plans with advertisers or agencies, develop calendars for tracking collection agency performance, record payments and expenses received to date against funds collected. Analysis reporting includes: Dunning/Collection letters, Over Credit Limit Audit and Collection Agency Performance Report. Unified customer database organizes communications between departments -Publishing Management, Advertising, Sales, Order Fulfillment, Production, Accounting, Accounts Receivable, Credit and Collections for time savings and accurate data. All data is exportable to popular Page layout and spreadsheet applications. All reports are PDF ready and emailable. System administration feature provides sophisticated, secure "lock out" ability with a variety of security levels-user, groups, screens, modules, process feature and function codes.